Oh what a different book. I enjoyed it from the first letter to the last. To write so beautifully about something so dramatic and horrible as war, hate, forbidden love and racism takes a real good author. 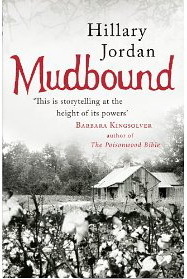 Hillary Jordan managed that in her very first book, the prize-winning 'Mudbound'. And what's more, every scene in the book passed in front of my eyes like a movie... or as Kingsolver says 'Her characters walked straight out of 1940's Mississippi and into the part of my brain where sympathy and anger and love reside, leaving my heart racing'. When Jamie McAllan and Ronsel Jackson return from fighting World War II, the unlikely friendship of these brothers-in-arms sets in motion a harrowing chain of events that test the faith and courage of both families. As they strive for love and honor in a brutal time and place they become players in a tragedy on the grandest scale and find redemption where they least expect it. It is told from the perspective of this six characters — black and white, male and female; Alternating first-person narratives, each of them contributing their part of the story from their own viewpoint with their own memories and feelings, perfectly blending and overlapping back and forth with the others'. It keeps a straight line of strong excitement with not much ups and downs except when you reach the end... you can't stop reading even if it's 2 o'clock in the morning and workday next day. I often been mentioning books that give a bit more than just a good and exciting story... this really is such a one.